Now that you had all the fun splashing colour at each other and relishing all the sweets and savouries of Holi, it’s time that Diet Clinic recommends you to get rid of all that you have stuffed yourself with during the festivities through a detox program from us. We understand that it is not only the internal systems that have been overloaded but the harsh colours and chemicals in them have impounded its effects on your skin as well. We strongly recommend to keep yourself hydrated with maximum intake of water. Drink at least 3 to 4 litres of water a day to help the skin and the body flush out the harmful toxins and chemicals been accumulated. Since consumption of lots of sweet during Holi is common, ensure having plenty of salads that will aid in the detoxification of the body. “Holi” – embarks the arrival of spring along with its colourful and joyous faces all around. Children, adults and elderly, all treat each other with the warmth of love and lots and lots of sweets and colour. But with the over indulgence of food and colours brings in upset tummies and irritating skins. At Diet Clinic, we take this opportunity to wish you all a ‘Happy Holi’ and present you specially crafted Holi Detox Programs to keep you safe and healthy from the festivity blues. Detox is very essential to cleanse your body system and your skin after the rich foods and harsh colours that have affected your skin. Choose from the separate detox plans for skin & hair and body and get back to normal in no time by flushing out the unwanted stuff from your system. After all that gujjia and namakpare, along with choley bhature, that you could not refuse because it was too good to resist having just one, and of course how can you stay away from all that food during the Holi? But all these lands us with indigestion and upset bowels. 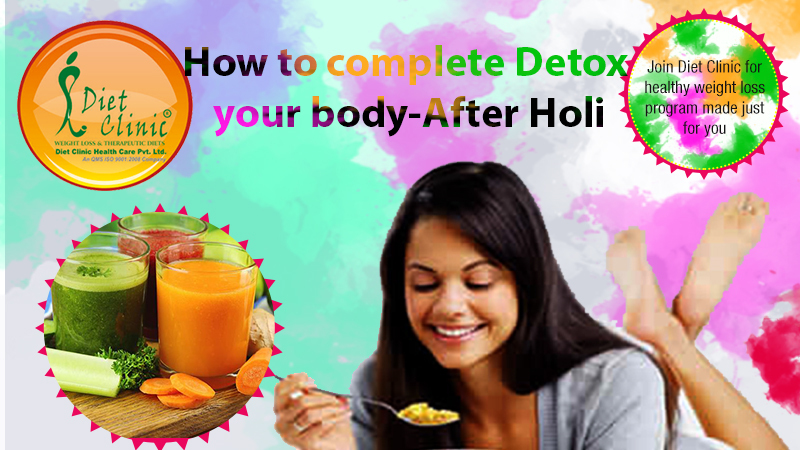 Now, whatever you deal with after the Holi, choose to cleanse your internal organs with specially designed detox diets from Diet Clinic. Try out the simple and very effective water based detox diets of Diet Clinic, like the Ginger – Mint Detox Diet, the Mixed Berries Detox or the Orange Honey one to get rid of the unwanted toxin build up in the body by flushing them out and as well keeping you hydrated at the same time along with providing the vital nutrition required for healthy after.